How do I know if my horse's hooves are healthy? As a horse owner, one major responsibility is making sure that each horse's hooves and lower limbs are frequently checked for injury, damage, disease or any condition that might affect the soundness of the horse. Knowledge of the anatomy of the horse's foot including the hoof and all its internal structures is of paramount importance in being able to assess the condition of the horse's lower limbs and feet. Enlarge this picture to get a good view of evidence of a hoof abscess that may explain this horse's lameness. Damage and injury are usually evidenced by lameness, wounds, lacerations or abrasions, cracks in hoof wall, tenderness to the touch, or other visual clues. On the other hand, some hoof diseases and conditions such as navicular disease, puncture wounds, and laminitis may develop undiscovered for a period of time. 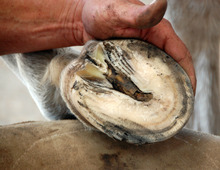 Scheduled hoof trims are the best way to maintain healthy feet and detect problems before they become costly vet bills. 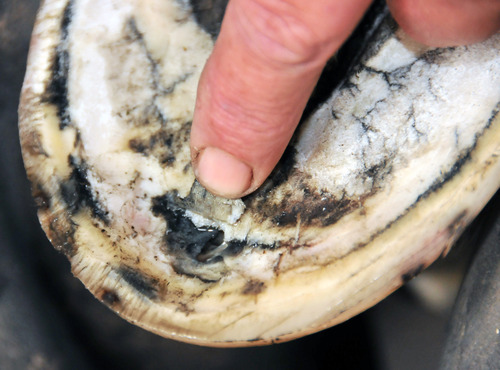 These infections of a soft portion of the hoof often start as a result of a puncture wound or injury. Signs of an abscess include lameness accompanied by severe pain in the affected area, a dark spot on the hoof, oozing or draining of pus and blood. When the sole is bruised because of improper shoeing or hoof trimming, or by rocks or other foreign objects, the horse may become lame. Corns are bruises of the sole that occur at the angle formed by the wall and bar often on the inside buttresses of the front feet. Shoes that are left on too long, are too small, or trimming the heels too low may result in excessive sole pressure over the buttress. Evidence of corns and sole bruises include yellow or red discoloration of the sole, lameness, and soreness of the area when a hoof tester is used. Horse's hooves are susceptible to a variety of kinds of cracks including grass cracks, sand cracks, and horizontal cracks also known as "blow-outs." A crack is a separation or break in the hoof wall and are identified according to their location as toe, quarter or heel cracks. Grass cracks begin at the ground surface and extend upward, while sand cracks begin at the coronet and extend down. Grass cracks often occur in unshod hooves when the hoof wall is not trimmed regularly and becomes too long when it cracks because of percussive force. Sand cracks usually occur as a result of cuts and injuries to the coronet. Too much moisture or repeated wet-to-dry circumstance that cause expansion and contraction of the hoof wall also lead to hoof wall cracks. In addition vitamin or essential amino acid deficiencies may be a contributing factor. Hoof cracks do not unite from side to side, but rather new horn starts at the coronary band and grows down much like the growth of a finger nail from the nail bed. Hoof injury and disease have ended the careers and lives of many champion horses. Signs include a horse that walks as though on egg shells, shifts weight to the rear feet, is resistant to walking, wants to lie down much of the time. 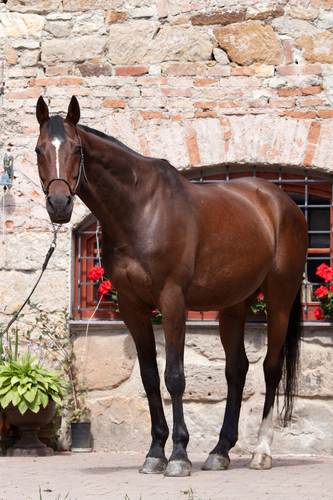 Laminitis is considered a medical emergency and a veterinarian should be notified immediately at the earliest signs of this disease. This disease begins with inflammation and gradual deterioration of the bony tissue of the navicular bone. Genetics and poor conformation, improper nutrition and continual impact of the toe against hard surfaces are the usual causes. Intermittent lameness that gets worse over time and a toe that is worn away from hitting the ground are early signs of navicular disease which usually affects the front feet. Quittor is a chronic deep-seated infection of the lateral cartilages of the coffin bone. Penetrating injuries to the sole or injury from being stuck by another hoof are usual causes. Sinus tracts that open at or above the coronet are the site of a discharge of pus and swelling along with heat are noticeable over the lateral cartilage near the involved quarter of the foot. During an acute attack, the horse will become lame. In this disease infection caused by bacteria, yeast or fungus causes the white line to disintegrate. The disease starts at ground level and works its way up to the white line to the coronary band. The loss of horn creates a hollow space between the hoof wall and the sole creating a mealy or "seedy" condition that leads to development of a cheesy material, loss of supporting horn, and eventual rotation of the coffin bone. It is often a consequence of laminitis. Limited exercise, damp wood shavings for bedding, a wet stall and frequent wet-to-dry situations lead to development of this disease. Some early stage hoof disease and conditions are only apparent on a clean and trimmed hoof. Catching these conditions early may avoid a lameness or more serious problem. Thrush is a painful bacterial infection of the frog resulting in a foul smelling, dark, clay-like material in the area surround the frog. It results from the frog being consistently packed with manure, mud or moist bedding combined with lack of basic hoof care such as regular picking and brushing. If not treated promptly it results in infection of the sensitive laminae and may infect the digital cushion leading to lameness. The heel of the hose's foot has two bulbs. In a balanced foot, both bulbs contact the ground simultaneously. In the condition of sheared heels, one bulb strikes the ground first causing the horse to bear weight on the inside of outside of the heel. This causes an upward displacement of the heel bulb in relation to the other. This leads to pain and results in lameness that sometimes leads to navicular disease and predisposes the horse to hoof wall injuries and thrush. 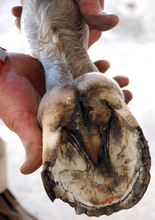 Improper hoof trimming and a fault in the horse's conformation are often the cause of sheared heels. Ossification of the lateral cartilages of the coffin bone is known as "sidebones." It is most common in the front feet but may occur in all four feet. Excessive concussion combined with incorrect shoeing causes the cartilage to convert into bone. Faulty conformation is often a predisposing factor. In the acute ossifying stage, pain, heat and swelling occur over the affected quarters. Horses with sidebones are seldom lame unless other conditions and diseases such as navicular disease are present. In all cases involving hoof conditions, diseases, or injuries, your veterinarian along with your farrier are your best sources for information about your horse and your particular circumstances.